The Norman knights that placed and built a castle and keep at Clitheroe would have hardly thought that their luck rested on the geological activity of around 300 million years ago. Built on a reef belt and Walsorian mud mounds the castle dominates the landscape and enabled these feudal lords to have a birds eye view of the local population and approaching enemies. Geology still plays a part in the economy of Clitheroe as in today’s active cement works industry. 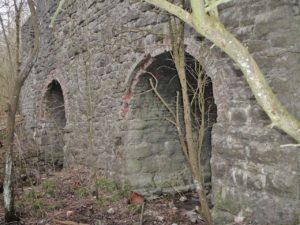 Limestone workings from the 19th Century are also still visible locally. 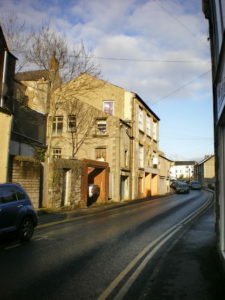 Relatively recently Clitheroe became the administrative centre for the Honour of Clitheroe. After being held by Roger Poitou an Anglo Norman aristocrat the lands passed to the De Lacy’s and from there to Thomas Lancaster in 1311 whereafter they became part of the Duchy of Lancaster and forever belong to the reigning monarch. The Honour of Clitheroe held the Wapentake for Blackburnshire therby holding manorial juridsdiction dispensing justice in Halmote courts, Swainmote courts and Woodmote courts. The earliest existing charter goes back to 1283 where rights were granted by forbears from between 1147 and 1177. 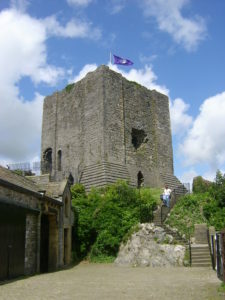 The Battle of Clitheroe in 1138 saw the Scottish forces of King David in the area. 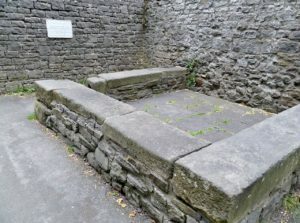 In 1420 some unlucky person buried a hoard of silver and was unable to retrieve it, this is now in the custody of Clitheroe Museum, a very interesting place to visit. The Free Grammar School founded by King Phillip and Queen Mary is still in existence today obeying their wishes to provide for “the education, instruction and learning of boys and young men in grammar; to be and to continue for ever.” No suffragettes around in those days then! However, it is now a co-ed. school. An iginominuous fracas in the Civil War left Clitheroe to be held by the Parliamentarian forces. As you might already know there is a very mixed bag of history in Clitheroe. Let’s see what Peter del Strother will tell us on the first talk of the 2019/20 season. Peter is a well known speaker and we are very much looking forward to him helping us to broaden our knowledge of this charming town.